Linking in WordPress can be an intimidating task at first, but this post will guide you through the steps and show you just how easy it can be. This post will also cover several different types of links, and the legal guidelines that must be followed when making these links. Soon you will be creating professional looking links that are neatly embedded in your own site. The first thing you need to do is decide what it is that you want to link to. The methods are the same whether you are linking inside of a post or a page, but you must determine what you are linking to before creating that link. Once you determine what you are linking to, there are a number of ways you can get the link information needed. The first is the most obvious, it is the address bar. You can just copy the information right from the address bar as shown below. If you don’t want to grab the information from the address bar, there are a few easier ways to get the information needed. If you want to link to any posts, pages, categories, tags or authors, this method applies to them all. All you need to do on your page is find a link that WordPress has created to what it is you want to create a link to, right-click, and select copy link address. This will do the same thing as copying the information from the address bar, but without having to go to the page to do so. Some examples are shown below. 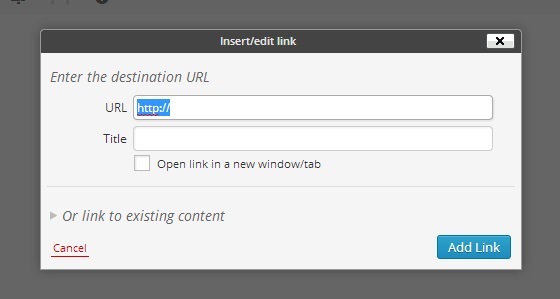 Once you have the link information, you can either insert the link through the visual editor, or the text editor. You may find one easier than the other, so to each their own. 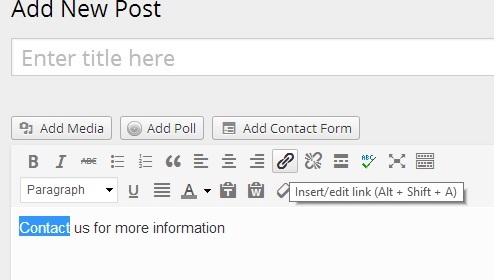 For the visual editor, enter the text that you would like to have the link embedded into. For example, if you are linking to your contact page, you may say something like “Contact us for more information”, and the word “Contact” may have the link to your contact page embedded into it. In that example, you would highlight the word “Contact” and click the little chain looking button that says “insert/edit link”. Once you do, there will be a popup asking for the link information. In the URL portion, this is where you will paste the link information that you had previously copied. Below that in the Title portion, you will make a brief description of what it is that you are linking to. In my example, I used Google.com, so my Title said “Google Web Search”. That is a good short brief description so the reader knows where the link is taking them to prior to clicking. You would then click “Add Link” and Ta-Da! You have created your own embedded link. Pretty simple huh? Now we will go through the same process in the Text editor for those of you that are savvy with the internet languages. The steps are very similar, so this will almost be a review of the previous section with slight differences. 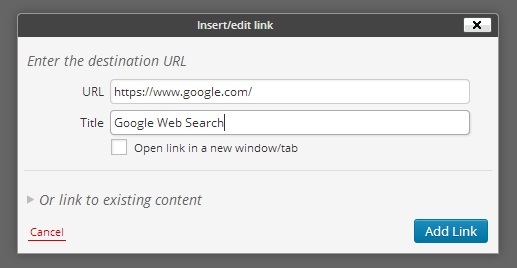 So after you have copied the Link Address from wherever it is you are wanting to link to, you would go into your text editor and select the text you want the link embedded into. The same popup from the visual editor will popup. Fill in the popup just the same as the visual editor popup and there you have it. Another link. NOTE: On the popup you will note there is an option to have the link popup in a new tab or window. It is important that you do not select this option UNLESS you notify the reader that you will be opening a new window or tab prior to them clicking on the link. For example, you would have to say something along the lines of “By clicking here, our contact page will open in a new window.” This is a standard for all of the internet, and it is the law. These rules are put into place for a good reason, and they must be followed. If not, you could be the recipient of a nice hefty fine. Now, onto the not-so-fun legal part about linking. We have covered just a little bit with the popup option for opening your link in a new tab or window, but there is a little more to address. Images: In order for you to put a link to an image on your site, you must first obtain permission from the owner of the photo. This falls under the copyright laws, and by putting the photo on your site, with your text is like passing the photo off as your own. Defamation: By creating text that states for example someone stole your idea, and creating a link to their site, the link itself is what turns your statement and the link combined into defamation, which is illegal. Trademark: Much like the copyright issues, if you are not careful and give credit where credit is due, you could be liable for using or taking credit for someones trademarked work. This information was taken in part from BitLaw. Now don’t be too intimidated by the legal stuff. The one thing to keep in mind is that if it is not yours, you need to rethink whether or not you want to really use it. There is nothing wrong with linking to someone’s work, but you must make sure that you are giving credit to their site or work. The best rule of thumb to follow is if someone else did the work, let everyone know. Without links the internet would not exist, so don’t get too freaked out. If you are looking for more examples, just visit your favorite site and see how they give credit for their links. Links are very common, and are a good way to give your readers a bit of extra information without retyping all the hard work that someone else has already done. I hope you enjoyed this post on How To Create a Link, and are now able to create your own embedded links with no problem. There are many other ways to link to things including email addresses, so once you feel comfortable with how to do these types of links, get creative with your links and search the web for more ways on how to create links. The possibilities are virtually limitless.